Thanks to its compactness Calzanetto Compact, you can easily take with them everywhere: in the car, in your bag, in your suitcase. Only our self-polishing sponge is soaked in refined high density silicone oils. A unique and incomparable formula, cleans, polishes and protects all leather objects of any color. This product is also available in suede and black. Take the sponge from the cardboard box without throwing it away (it will be useful in the future for keeping the product properly and recognizing it immediately). Remove the sponge from the transparent tray and pass it over the shoe leather with medium pressure. The shoe will become clean and shiny immediately. Suede, kip, untreated light or "open-grain" leather, nappa, nubuck, peccary, alcantara. 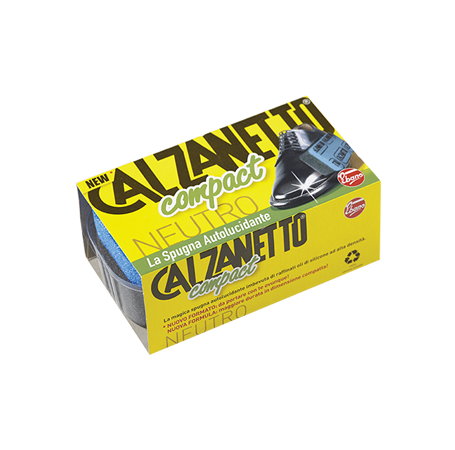 Calzanetto leather super-polishing treatment, it acts thanks to the gradual release of the refined blend of silicone oils contained in the sponge. Absolutely harmless for leather, it deposits a protective layer on it which confers shine, softness and slight waterproofing.